“Why not?” I simply responded. I liked them. Not sure why. Perhaps because they were shiny. Perhaps because they reminded me of something else. Not sure why. Not sure it mattered. I knew that after getting them, I would use them, again and again. I had had this cake idea for a while because I wanted to combine the colors green and chocolate together, two colors I simply love when they are next to each other. Somewhat reminiscent of a marbled cake, this is an idea for individual cakes perfect to be packed in a bag before going on a trip. An idea for a brunch, or an afternoon tea. For any time of the day, really. And, since my mum is the one who taught me to make marbled cakes — I wish I could say how many we must have baked together — I am dedicating these cakes to her, because today is la fête des mères (Mother’s Day) in France! To the wonderful woman I love who taught me so much about loving and caring for food! PS: And today is a short post because we are still busy with the conference. Great stuff! Melt the butter and keep. Melt the chocolate using a double-boiler. Beat the eggs with the sugar until white in color. Add the melted the butter and mix well. Add the sifted flour and baking powder, with a pinch of salt. Divide the batter in two halves. In the first half, add the Matcha tea, in the second the chocolate and cocoa diluted in milk. Grease 6 small molds and coat with flour. Remove the excess. In equal proportions, pour in each the chocolate, then the Matcha tea preparation. Run a fork in the batter to describe a movement. Bake in a preheated oven for 30 min, temperature 350 F.
Battez les oeufs avec le sucre jusqu’à blanchiment. Ajoutez le beurre fondu et mélangez bien. Ajoutez ensuite la farine et la levure tamisée, avec la pincée de sel. Divisez la pâte en deux. Dans l’une, ajoutez la poudre de thé vert Matcha, dans l’autre le chocolat fondu et le mélange cacao et lait. Beurrez et farinez 6 petits moules. Versez le chocolat, puis la préparation au thé matcha. Faites un dessin avec une fourchette. Mettez au four pendant 30 min, préchauffé à 180 C.
I love the combination of colors and also flavors — matcha tea is something I’ve been trying to incorporate into my baking, as I do not like the taste of the green tea when you drink it. Anything paired with chocolate is good, isn’t it?! Ta petite recette est vraiment trop chouette! Looks lovely! How much matcha would you suggest to use? I’ve been wanting to use matcha for a long time …but I never thought to combine it with chocolate. hmmn…I don’t see the matcha in the ingredient list…or am I just missing it. du chocoalat amer marié au thé vert, mais c’est pour moi cette recette ! Que bonne idée! I just made green tea medelienes not too long ago–I like the slightly bitter-sweet flavor it imparts. Chocolat et thé matcha : un mélange qui gagne à tous les coups ! J’aime ce mariage de saveurs, et le contraste des deux couleurs rend les petits gâteaux irrésistibles. hum ca a l’air tentant. Quelle est la proportion de thé macha, svp ? I hope the conference is a blast. I am frequently visiting your wonderful blog. It is such a pleasure both for the eyes and the taste buds! Your photos are fantastic and your cuisine is delicious. You add joy to my life! encore une recette que je vais devoir tester !! J’ai deja achete les barquettes…. That sounds like a lovely combination. Sounds like you are having such a great time at the conference. I keep trying because I am a huge green tea fan(drink it all day long) but I just can’t get into it as a dessert. Maybe these will change my mind. I make matcha cookies. ow I’m going to dip them in chocolate. Thanks for the idea of combing matcha anc chocolate Bea. Ta maman devait etre ravie de l’attention, ce sont les cadeaux les plus beaux, ceux qu’on fait nous-memes. 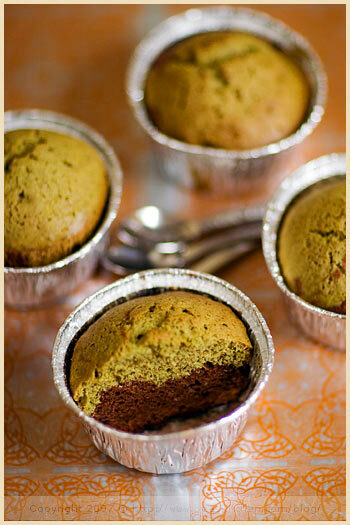 I first had the combo in a dark chocolate and matcha tea financier from Aioki and loved it! I can only imagine how these taste like. Gorgeous! I love matcha in anything, and then there is the fact the your cakes are so CUTE! les grandes matcha addict se rencontrent…j’en ai fait moi aussi il y a peu de temps, mais j’ai battu les blancs en neige…J’ai aimé, d’habitude dans les préparations cuites on ne le sent pas trop, là c’était très bien. Je testerai les tiens bientô^t! May I mail you some matcha of better quality so the result can be a beautiful color (and probably better taste as well)? 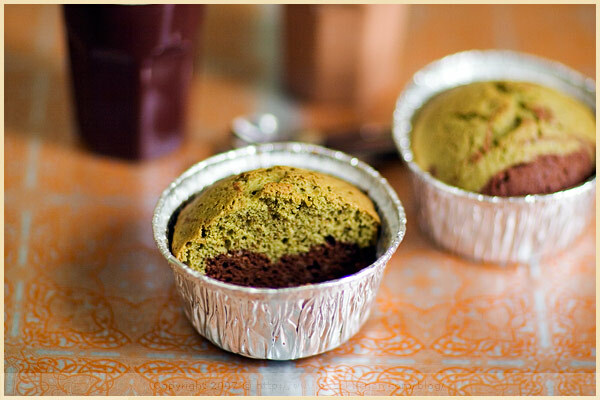 I am looking for a Matcha green tea cake and baking mix. The place I used to buy this,discontinued it. Can you help me with this or do you have a reciept for just green tea cake and baking mix? Sorry I do not have a recipe for what you are looking for. Perhaps you should google the products you need. Thank you sooooo very much Bea! Your cooking has inspired me to cook and to bake in particular. I made my first MARBRÉ (chocolate and vanilla) today. My kids just looooooved helping me making it and after…… mmmmmm ….. the best part – liking the pans….. : ) Thanks again….